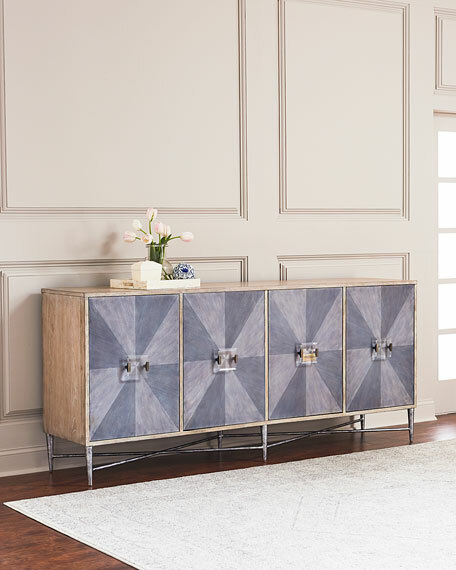 This wonderful combination of colors and textures creates dramatic visual interest for this credenza. 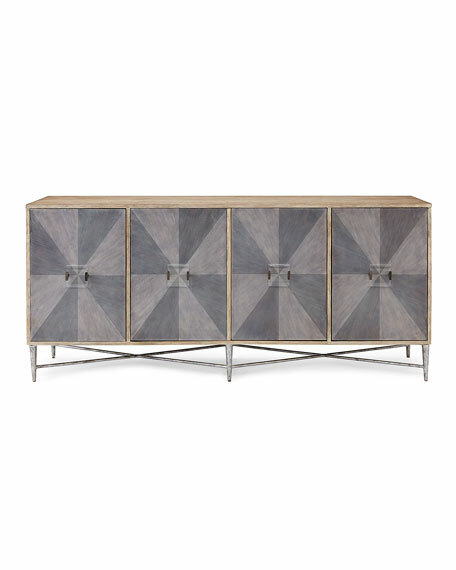 The overall finish is a soft medium brown natural wood tone with contrasting light and gray hues on the door front creating a dimensional pattern, highlighted with large scale acrylic hardware. Supported on silver/gray tapered metal legs with a crisscross stretcher base. There are four doors, each house a adjustable/removable shelf. It comes with soft closing door hinges and a ventilated back panel to form a wonderful entertainment, accent or dining room option. Fours doors; each with one adjustable shelf. Poplar and hardwood solids with maple/elm and black walnut veneers. Acrylic hardware and metal frame. 86"W x 21.5"D x 38"T.